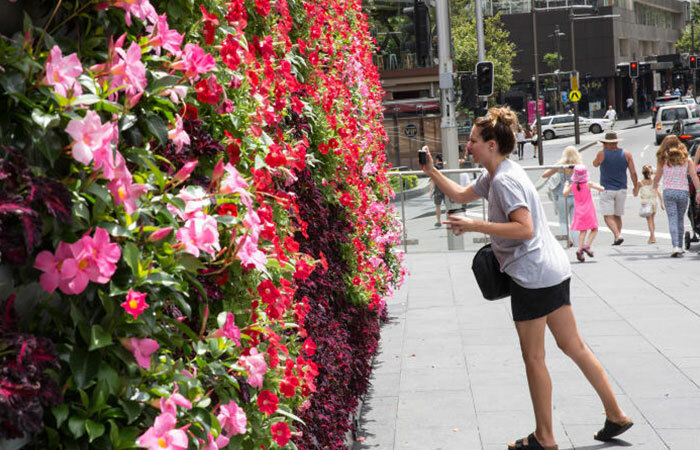 Every night from 31 August to 6 September 2015, while the City of Sydney slept, a team of specialist landscapers from Citywide Open Space team donned their gloves and wet weather gear to bring life and colour to the inner-city streets. With 26,000 plants, 800 crates, 100 caf? planters, 27 floral towers and 1 pyramid tower, our Citywide team installed 74 magnificent floral displays including a vibrant ?Greenwall? at Martin Place. The Spring 2015 displays are made up of simple geometric shapes and interlocking planes. The straight lines and angular shapes reflect the built environments of cities. Using their extensive landscaping and horticultural experience, the Citywide team set-up the displays to turn the two-dimensional plans into a three dimensional reality full of vivid life. The installation was a seamless team effort, said Simon Belinfante, Citywide?s Supervisor of Living Colour. ?We all worked together and kept each other going with humour during the long nights in the week of the installation. Having played a part in creating something so invigorating for the community is very gratifying.? ?Bright and beautiful streets encourage people to connect, socialise outdoors and enjoy the city?s spaces.? The result is worth the wait and worth its weight in gold? and blue petunias, and orange snapdragons and yellow marigolds? With the installations complete, the inhabitants of the city delight in the discovery that the fabric of the city has changed ? with the stunning floral displays it is more alive, more natural and brings happiness to peoples? day. ?As the flowers have grown, people in the city have watched them change and bring life and colour to our streets and squares,? City of Sydney Lord Mayor, Clover Moore said. An impressed Glebe resident provided the following comment on the hanging baskets, ?I would like to offer my praise for the wonderful display they offer residents and visitors to the street. They are a credit to your department in the way of selection and maintenance. I thought the begonias last year were a treat but this year surpasses the last. I was in the nursery industry for 30 years and understand what’s involved in undertaking such a project. ?